Take a Guided Tour Through the Historic Streets of Charleston! Charleston is known for rich history, astonishing landmarks, and wonderful southern culture. If that is why you decided to visit then a carriage ride is for you. 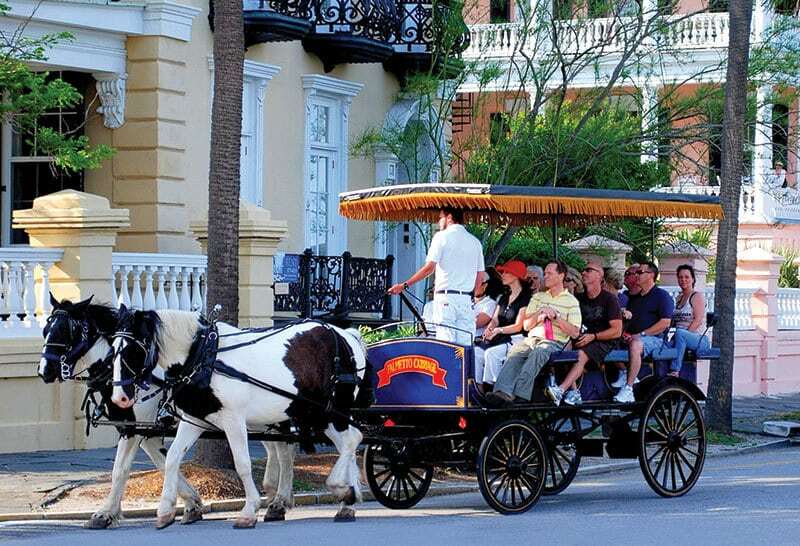 Palmetto Carriage is Charleston’s premiere carriage tour company. From knowledgeable tour guides to their impeccable animal care record, they have proven themselves as the industry standard. A carriage tour is a must do on any visitor’s list of attractions. Here is a little about what makes Palmetto stand above the rest. All of Palmetto’s tour guides must pass a standard citywide tour guide test. Palmetto Carriage goes one step further with its own unique 30-day training program to ensure the safety and satisfaction of their customers. Very few guides make the final cut and that is one of the reasons why the product is consistently the best in the industry. Many of their guides have been with Palmetto for 10+ yrs making them the most experienced and entertaining Guides in Charleston. Palmetto Carriage begins their tours in their Big Red Barn located one block north of the City Market. Once inside the barn visitors can take a look around their operation. This is the reason Palmetto chooses to start and end their tours from their barn. Everyone who takes the tour, as well as passers-by who wish to take a look inside, can see a behind the scenes look at just how far Palmetto goes to care for its animals. From animal temperatures logged after every tour, to scheduled breaks and farm time, visitors can see first hand just how much time and effort Palmetto puts into its animals. Animal care is one of their main priorities and they have always made this their goal. It is obvious to anyone who enters the Big Red Barn. Feel free to meander around and ask questions. There are many carriage companies to choose from in Charleston. If you want the best tour, the best value, a tour that will be the highlight of your trip, then the easy choice is Palmetto Carriage. They guarantee your satisfaction. Check Availability & BookClick here for more info! COUPON $2 Off Per Person – Mention or enter code when booking “Traveler”.